We have booked our flights for our trip next year. Starting at Rome (2 weeks), then onto France (2 weeks) and then 2 weeks in the UK. I am most excited about finding the original of a painting which has my Great Grandmother in it! It appears to be quite a famous painting in the area and is currently being held at the Plymouth Art Gallery. You can see her (standing) in the pic. There is a strong resemblance to some of our family members. The story goes….. that my Great Grandfather was an alcoholic who left my Great Grandmother with the 4 girls to rear (one of them being my much loved ‘Nan’). 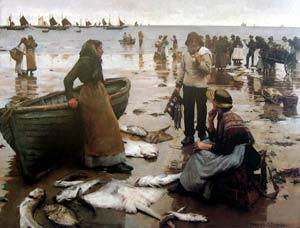 They were living in Newlyn, Cornwall and she had no money so she posed for these paintings, over several months for Stanhope Forbes. She can also be seen in other paintings by the same artist. Maybe they will give me a painting for being related. Or maybe not. Apart from seeing the house my Nan was born in …….. I can’t wait to go there! My only questions is….. how did they keep the same dead fish posing for the pic? ?